GE shares fell in Tuesday trading as far as the lowest close during the financial crisis. The stock has been battered this year, falling more than 61 percent. Employees work on a turbine at the General Electric plant in Belfort. 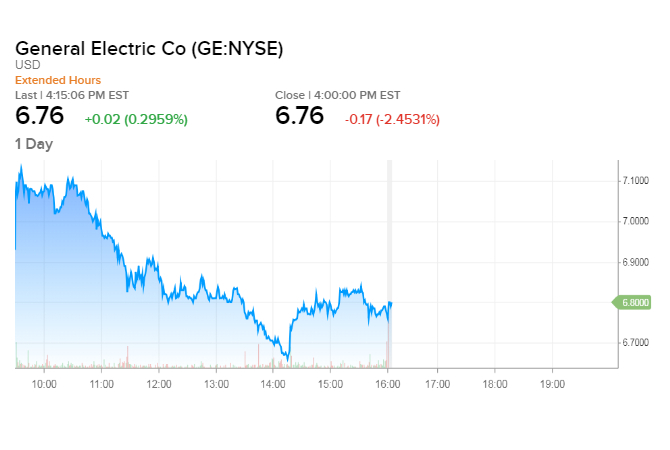 General Electric shares fell as low as $6.66 share in trading Tuesday, a level which marked the lowest close for the stock during the financial crisis a decade ago. GE made its painful dividend cut official last week, with the company's board of directors authorizing the payout to be cut to just a penny a share. Many analysts on Wall Street have warned clients that the dividend cut is likely just the beginning of a slow and difficult process for GE. The stock has been battered this year, falling more than 61 percent. Despite a brief rally after the appointment of Larry Culp as chairman and CEO, the beleaguered industrial company's stock has sold off. GE shares have lost more than 33 percent since the company reported third-quarter earnings on Oct. 30. That day saw GE announce the quarterly dividend cut, report much lower earnings than Wall Street expected and reveal that the SEC and DOJ were expanding the scope of ongoing accounting investigations into the company's accounting practices. GE shares closed down 2 percent at $6.76 a share on Tuesday, its third-lowest close since the financial crisis. It closed at $6.66 on March 5, 2009. Its intraday low during the financial crisis was $5.73. Culp acknowledged in an interview with CNBC in November that his decision to slash the quarterly dividend to a penny sent regular investors scrambling. "When we announced on our earnings conference call that we were taking our dividend down to 4 cents a year, we didn't do anything positive for our retail shareholder base and they have been exiting the stock, I think, as a result," Culp said. At the time Culp said he "would make those same decisions," even as the stock was sliding steadily. "Those were the right decisions to make sure the company is facing forward," Culp said.